Last year, for her third birthday, I made Dolores a princess dress. Thankfully, the desire to be a princess seems to have loosened its grip a little since then, and her pirate games are becoming more frequent. 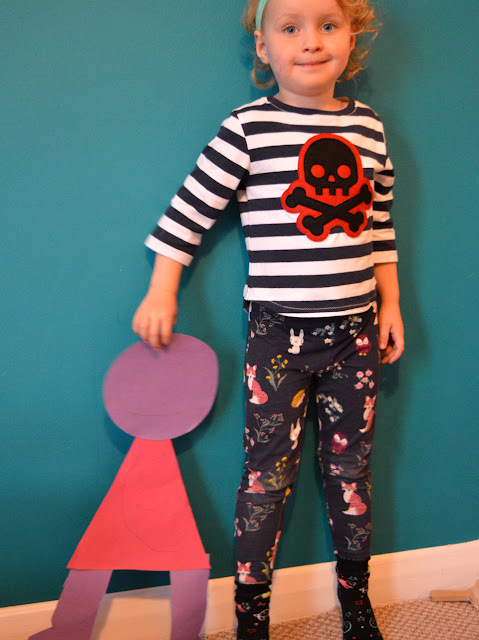 My aim was to make a whole pirate costume, but I realised time was tight so I focused on a top. I was pretty sure that some pirate-y vibes would be transmitted by the striped jersey that was left over from my Gable Breton top. 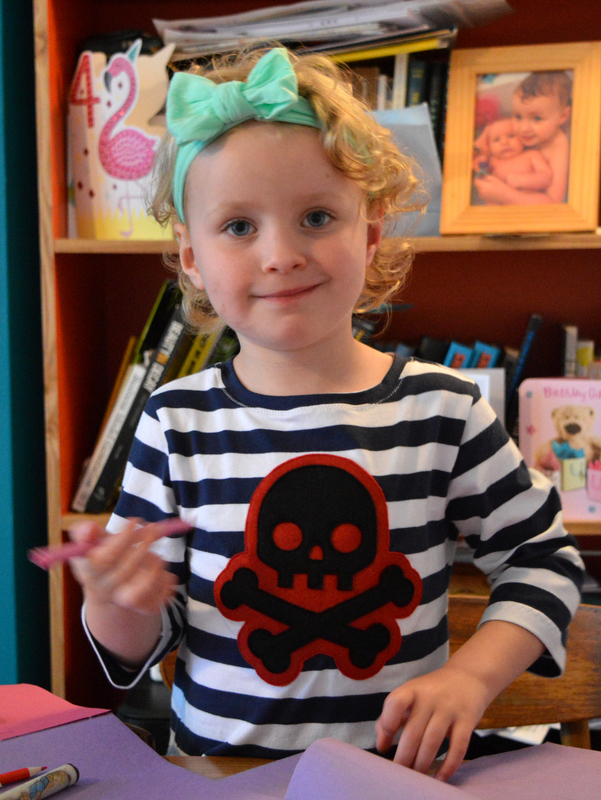 But fearing that it wouldn't be sufficiently pirate-y alone, I made a skull and cross bones appliqué using some shop bought felt. I used an appliqué foot on my sewing machine for extra visibility so I could stitch really close to the edges of the felt shapes. I love a bit of appliqué, me. Sure, most types of appliqué are super fiddly and time consuming, but I've almost always found that it looks the bomb once it's done. I've had my eye on this top pattern since I got the Spring 2015 issue of Ottobre design magazine over two years ago. It's a nice twist on a basic t-shirt shape, I love the bateau neckline and curved hem (I ignored the elasticated sleeve detail). Dolores is now about 104cm tall so that's the size I cut. I probably should have measured the pattern pieces against one of her T-shirts though because it's come up pretty short. 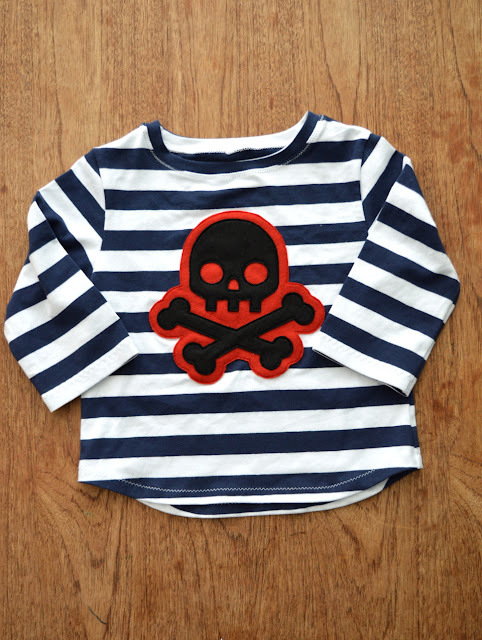 It was, however, pleasingly quick to sew together, just like making a mini Agnes top or something. I'm happy to report that she has decided to put this on quite a number of times in the few weeks since her birthday. However, despite its 'costume' status, it's clearly comfortable enough to continue to be worn after her game is over, so it then gets pen, chalk, dinner etc. all down it. I then wince inwardly, knowing the felt will probably go all bobbly with frequent laundry. But as a wise young Disney character once said, 'Let it go, let it go...'. 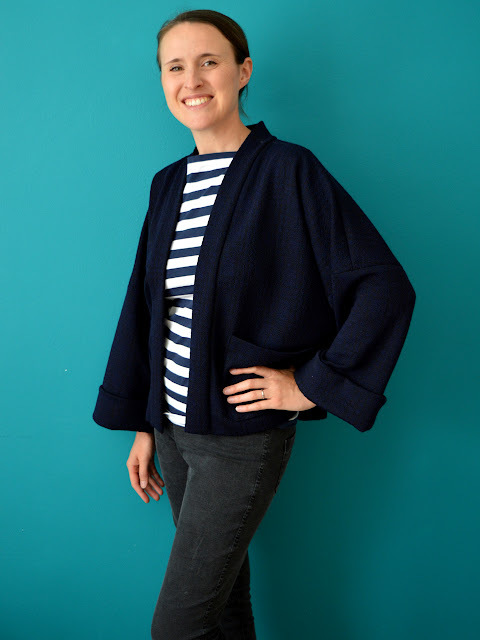 This project is a definite departure for me, style-wise, and another pattern by my current sewing-pattern-designer-crush, Delphine et Morissette (designer of La Brune). It took me a couple of weeks after finishing it to actually start to wear it, as the look and the volume feel quite different to the rest of my wardrobe. But now that I've broken the seal, it is the garment I'm most excited to put on at the moment and I wear it every day. 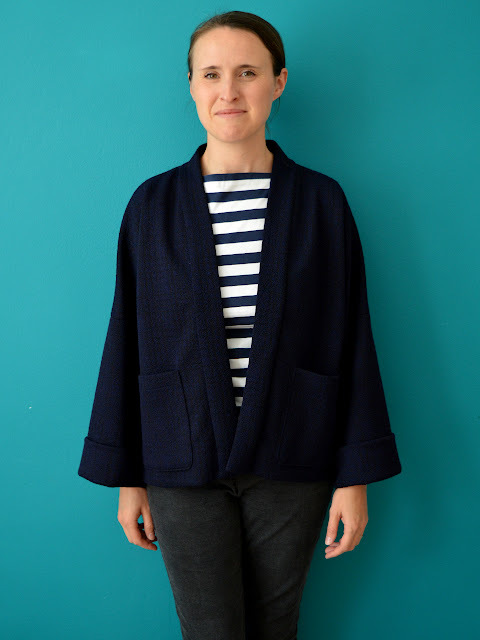 This is La Trop Facile (the 'Too Easy') pattern by Delphine et Morissette, a casual outerwear garment that can be made in a variety of fabrics. If you google this pattern, you'll find a surprising lack of other people's versions out there compared to some of her other patterns, and I'm not sure why this is. I love the no-frills utility of this garment, and, for me, it hits the sweet spot between 'cardigan' and 'jacket' that I didn't know I was missing. To buy any of her patterns, you have to make a request via a contact box; it's not an instant download like most PDFs. That may be frustrating if you want to get cracking immediately, but I found it quite charming to have some direct contact with the pattern designer herself. You can then pay via Paypal or bank transfer. Be warned: the PDFs are pretty basic. The patterns tile together like most PDFs, but the look a bit different as they aren't digitised, and the construction step-by-step page/s are in French with no illustrations or photographs. 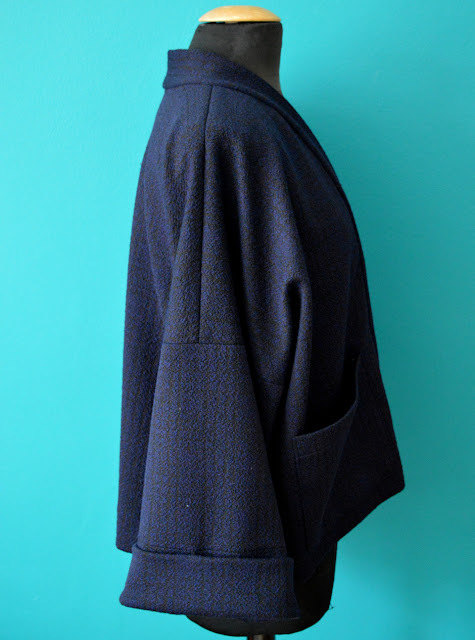 That said, some of her patterns have additional photographic step-by-step assistance through links on her blog but you need to go find the original blog post about each garment pattern to find them. I think. 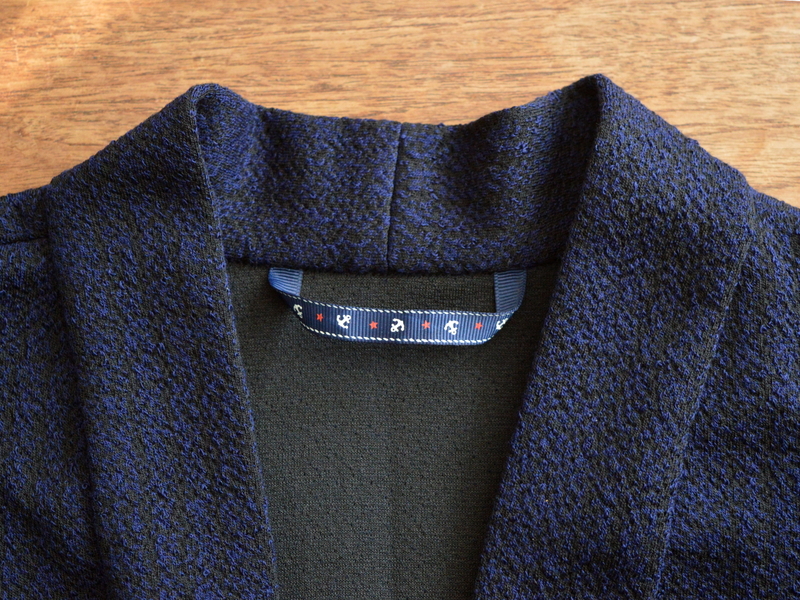 I bought this navy/black matelasse from Fabric Godmother, but I'm sad to say that they sold out of it some time ago. It's basically a stable knit with a slightly spongy quality, plus it's cosy and doesn't crease. 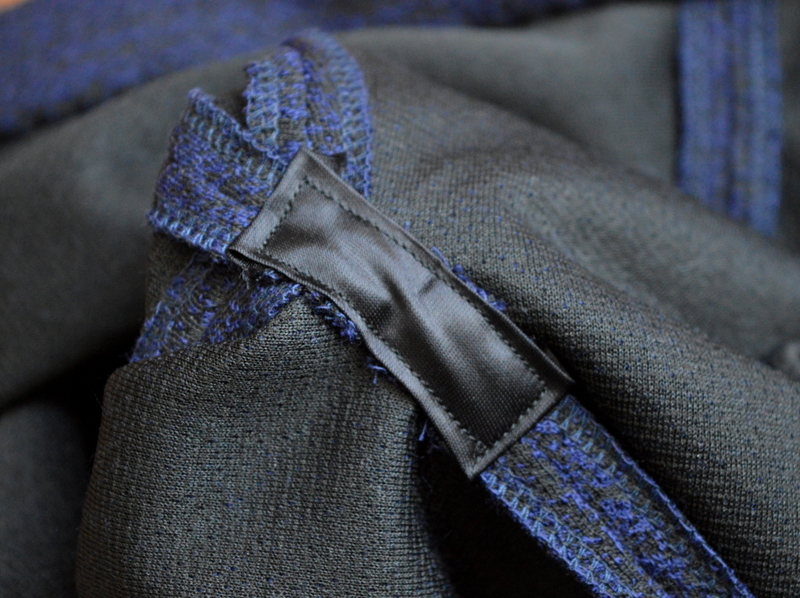 The deep, inky-blue colour seems to work relatively well when worn with both the navy and black items in my wardrobe. The pattern designer suggests that this pattern works in a wide range of fabrics. I'm tempted to try this pattern again in a loosely woven fabric for the warmer months (something like this). As I've already said above, I'm super into this garment. It feels to nice to wear, and has upped my daywear game by helping me look a bit more put-together than if I'd chucked on a cardigan to leave the house. It's also incredibly useful for when I'm wearing Frankie in the baby carrier. 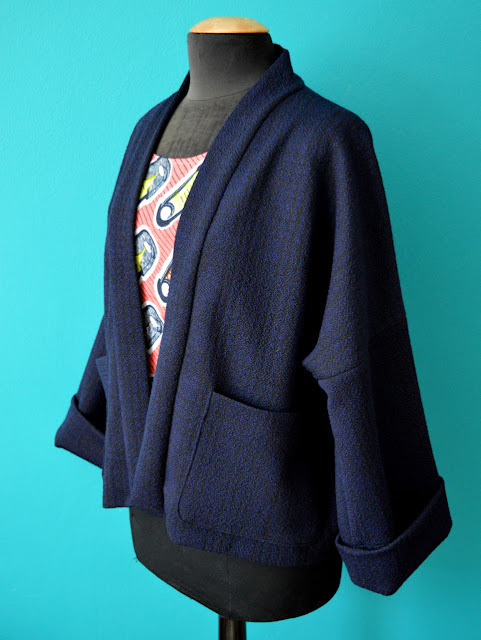 I'm hoping I can wear it for as possible layered and with scarves as the weather gets chillier. This is my new monthly feature where I road test a free sewing pattern or tutorial: sometimes a children's one, sometimes a women's one. I publish these posts every first Friday of the month, timed to provide inspiration for those of you who plan to get your sew-on over the weekend. I firmly believe that, if you pick your projects carefully, sewing doesn't have to be a crazy-expensive pass time. It's properly Autumn now here in UK, so it's cosy clothes a-go-go. 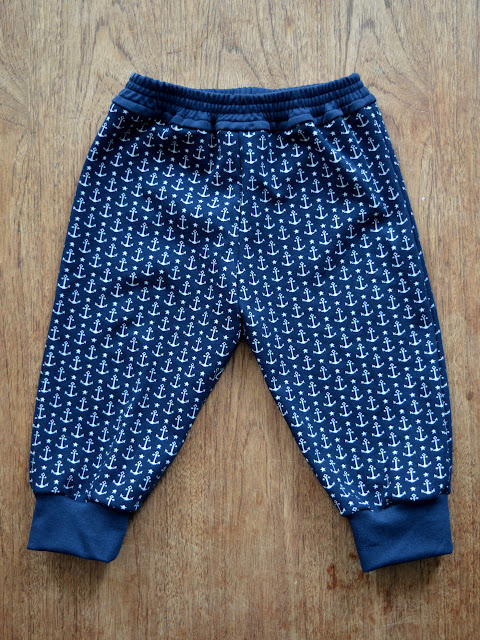 This is Elegance & Elephants's free Retro Sweatpants pattern for making unisex, old-school style joggers (thanks so much E&E!). 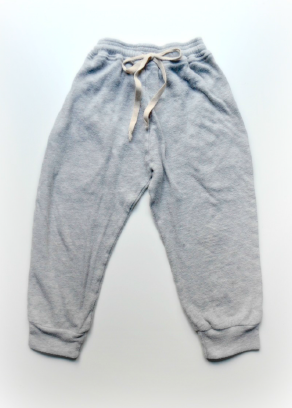 They include in-seam pockets, an elasticated waist and optional drawstring. This garment can be made with or without using an overlocker/serger. 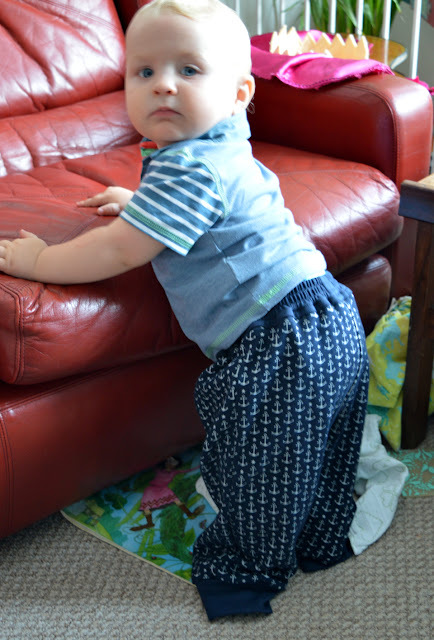 This is a multi-sized pattern from 12 months to 9 years. 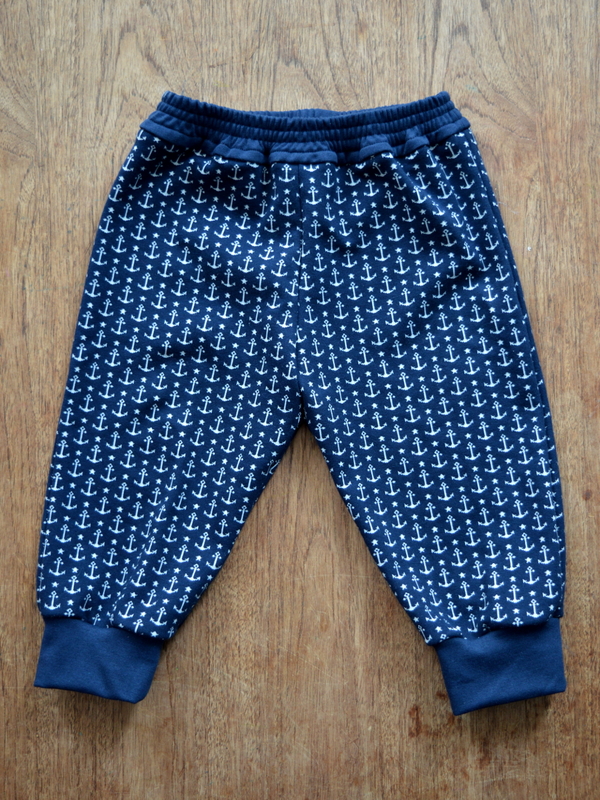 I made the smallest size (12-18 months). Frankie has just turned 1 and is fairly average sized, they came out quite big and I'm guessing these will probably fit him when he's about 18 months. The suggested fabrics include cotton ribbing (although it's not clear if that's just for the cuffs and waistband, or the whole garment), interlock, sweatshirt fabric and jersey. For my version, I've used some ponte de roma that was leftover from my recent cardigan project, and soft, solid ponte for the cuffs and waistband. French terry would also work well. 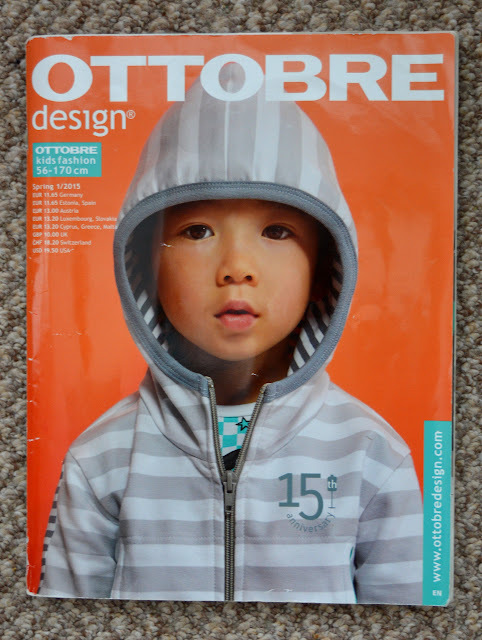 The pattern itself is a well-produced, digitised PDF. The instructions, although not the most detailed or 'hand-holdy' I've come across, feature clear, colour photographs to illustrate the construction steps so you can work out what's required easily enough. Because Frankie is still a baby, I decided to omit the in-seam pockets and the waist drawstring, which sped up this already quick project even more. I'm not super happy with how the waistband has turned out, but I'm currently too tired to figure out how I'd rather it'd be. That said, it's a great basic garment. 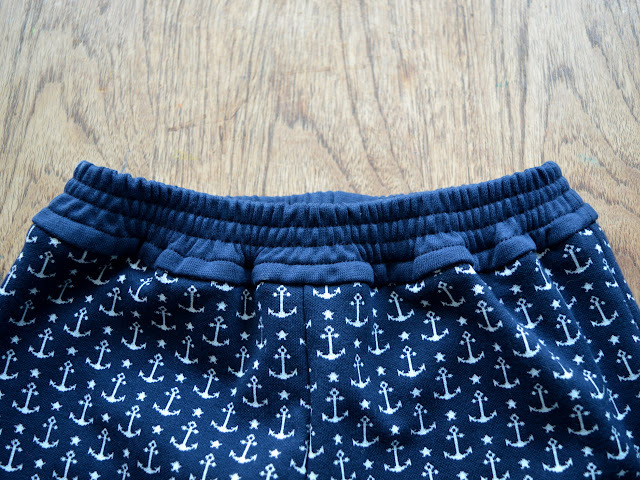 If you have some crazy energy-filled scamps that like comfy clothes, you could batch-sew a bunch of these and they'd be sorted for a whole season. Would I make them again? Overall, I'm pleased with how these turned out. I'm looking forward to seeing Frankie wearing them for real when he grows into them, but I'm not sure how much of that is about my deep love for this anchor fabric! I probably wouldn't make them again in this size, but I might return to this pattern for the larger sizes in the future.